The Roman Name in History is a customized book offering a unique blend of fascinating facts, statistics and commentary about the Roman name. The book is just one of an entire series of family name books in the Our Name in History collection. Each book in the collection is printed on demand and is compiled from hundreds of millions of records from the world's largest online resource of family history, Ancestry.co.uk. 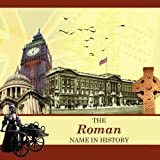 This particular book follows the Roman family name through history and makes the perfect gift for your family members and anyone interested in the Roman name. In the book you'll find out about where people with the Roman last name originated. You may discover the countries and ports they left behind, the ships they sailed and more. You'll get a better idea of where people sharing the Roman name settled and where they may reside today in the United Kingdom and other countries. You'll get all this information and much more in your Roman family name book.